On October 11th, the Bloom Impact team had the opportunity to offer a promotional training event for roughly 60 small business owners in partnership with the Association of Small Scale Industries (ASSI) - an important national organisation that helps the MSME sector with training, marketing, advocacy and other services. 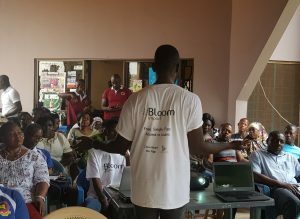 The event, held in Adenta, Accra, brought together small business owners in the region to learn about how Bloom Impact works and how it improves access to financial services. During the session, we explained the benefits of certain financial products like saving regularly and using a current account as well as how to become eligible for credit, such as by keeping good books. We also demonstrated the usefulness of our Android App, showing how you can create a digital profile and learn about and apply for a variety of financial products and save time and money. The session was very interactive as attendees downloaded and started using the app, allowing us to see first hand how they use it, understand and answer questions and identify additional ways to advance the product. The meeting marked another step towards improving access to finance for MSMEs in Ghana, as business owners attending our events gain knowledge about financial products available on the market in addition to discovering how their mobile phone can provide them further access and control over their finances.